SHARE Hampton Roads – a community building organization that offers nutritious food packages at discount prices. With two hours of volunteer service of your choice (in your community) you can purchase any of the SHARE packages. This program is for everyone and anyone – no qualifications, forms or membership fees. The food is ordered though a distribution center in the Maryland area, and NO Foodbank food is used in this program.To learn more about the next share day and locations, click here. Four Oaks Day Service Center – Newport News – now open! – offering the daily delivery of social services to individuals and families experiencing homelessness in Newport News, VA. To review this month’s workshops and other programs being offered to clients, click here. Care-a-Van – The Bon Secours Care-A-Van is a free medical service that provides general medical care to uninsured adults and children in Hampton Roads communities. Services include routine evaluation and treatment of common acute illnesses. To learn more and for monthly schedule, click here. Greater Williamsburg Network of Care – The Greater Williamsburg Network of Care: A Guide to Health & Human Services is for individuals, families, active military, veterans, and providers to find comprehensive information about local and regional health and human services and programs. To learn more, click here. 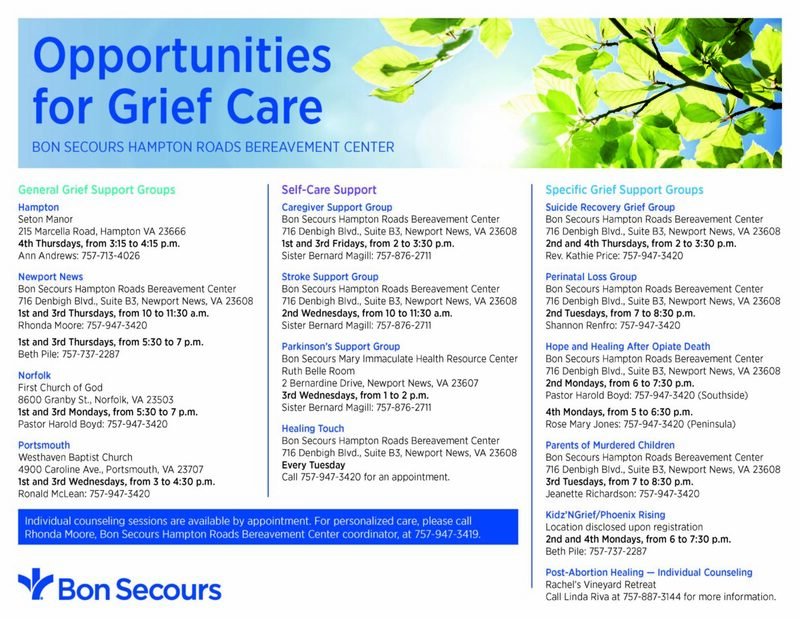 Grief Support Groups – Bon Secours Bereavement Center offers a variety of support groups for families and caregivers. Groups are offered throughout the year. For schedule and to learn more, click here. Care Coordination for Veterans & Their Families – The Virginia Veteran & Family Support Program provides resource referrals, care coordination, and supportive services to Virginia’s Veterans, National Guard, Reserves, family members and caregivers. To learn more, click here. Resources for Families – Kids Priority One provides a “one stop” resource center where families, and those working with families, find local resources and valuable information related to raising healthy, happy kids! Each month, thousands of parents, teens, teachers and other human services professionals visit Kids Priority One. To learn more, click here. Housing Crisis Hotline – (757) 587-4202 – The Regional Housing Crisis Hotline is the starting point for anyone who is experiencing a housing crisis throughout Greater Hampton Roads and in need of shelter, case management, and related services and/or community resources. Hours of Operation: Monday-Friday 8:00 a.m. – 7:00 p.m.
First Call Information & Referral – 757-594-4636 – For more than 20 years, First Call has been the number one source for referral to community services for residents of the Virginia Peninsula. If you NEED HELP with food, shelter, rent, utilities or other basic needs, call 757.594.4636. This telephone hotline is staffed by operators who will talk with you to determine your needs and refer you to the community services that may be able to help. First Call operators are standing by to take your call, Monday through Friday from 8:30am-6pm. Calls for emergency shelter are taken 24 hours a day, seven days a week. 2-1-1 Virginia – 2-1-1 is an easy to remember phone number connecting people with free information on available community services. When you dial 2-1-1, a trained professional listens to your situation and suggests sources of help using one of the largest databases of health and human services in Virginia. 2-1-1 VIRGINIA provides access to services in your community and statewide. All referrals are confidential and you can search for these same services on this 2-1-1 VIRGINIA Web site. To learn more, click here. Programs for Service Members – Mission United is a coordinated care network administered by the United Way of the Virginia Peninsula and that brings together the best public, private, and non-profit organizations throughout the Hampton Roads region. These providers offer a range of programs that are intended to serve our military community and their families. Powered by the software provider, Unite Us, this platform allows organizations to create and receive specific referrals. To learn more, click here. Resources for Special Needs Communities – No Wrong Door Virginia is a virtual system and statewide network of shared resources, designed to streamline access to long term services and supports for older adults, family caregivers and individuals of all ages with disabilities – connecting individuals, providers and communities across the Commonwealth. Additional resources can be found here. Winter Shelters – Area shelters for those in need of overnight shelter are available throughout the Peninsula from November through March. Shelters are housed at various churches and rotate weekly. To find the shelter nearest you on a particular night, click on the following links. Williamsburg area – click here; Newport News – click here; Hampton – click here; Gloucester – click here.